So you have successfully started your golf journey. Have you started collecting all the required golf clubs for your golf bag? What budget you fix for it and how much you spend for your first set of golf clubs is something else. But before all that comes the actual clubs that you would really have to buy. Are all the golf clubs worth splurging on? The answer to this question depends on your playing style, your playing frequency, and other factors. But no matter what type of golfer you are, a putter is something you cannot live without. Besides the above-mentioned factors, all the mallet putters on our list also look slick so you could play in style each of your putt shots. Standard grip provided and there is the freedom to choose a grip of your choice. So that’s our list. Here we take up each of the above products and review them so that you can get to know them better. The insert technology used in this putter is based on a Tour-winning concept. This has been a consistent hit among the golfers. If you look at the golf bag of the most popular golf players of the world, you are most likely to find an Odyssey mallet putter like the Hot Pro 2.0 V-Line. This is because this is one mallet putter that sets a new standard in the market in terms of the consistent performance it offers. When you are on the putt, at the verge of taking a crucial shot, if you need a putter that you can rely on it is this one. It feels light yet stable on the hand. So even the absolute beginners would find this putter easy to use. The putters in the V-Line series come with a 3⁰ loft. There are some of the most sought after head-shapes in this range as well. The sound, as well as the performance that the putter delivers for each stroke, is truly professional. The design is a versatile intuitively done marvel that suits both pros and beginners. Most of the head shapes that come in this range come with a high Moment of Inertia. Ask the pros and they would tell you how a high MOI would help maintain the consistency of your shots. High MOI would help give accurate shots even when your stroke is not as accurate in some rare cases. This comes in handy for beginners. It is slightly pricier than most other mallet putters if you are a beginner in particular. But this one would go a long way in your golf journey and so it is totally worth every penny spent. Talk about mallet putters, Odyssey is a brand that offers the toughest competition. This one comes with a heavy-tank design. To enhance the MOI there is a hi-def “Marxman alignment” designed in this club. There is a polymer insert that makes the roll pretty smooth. The back and forward swings both are consistent and fine thanks to the design. The heavy tank design is responsible for this too. This makes the hits at the putt easy. Your shots would also be more accurate. The design of this putters comes with a touch of the hybrid club design as well. Are you learning to chip perfectly? Have you noticed that it is not as easy to learn to chip as it looks on the field? Then this putter would definitely be a valuable addition to your golf bag. The 355gm mallet makes the club deliver a solid impact. This is what is required to chip perfectly on the greens. This also works on the swing and helps you correct your swing when you are in your learning phase. There is a heavy grip that makes the club feel balanced in your hands. For a pro-like turf, this one comes with an X-act sole. So your shots would no more be bogged down by bladed chips or stubbed shots. If you are looking to add some distance to your shots, it should be achieved without any loss in the accuracy. This is what you get with this putter- smooth and long roll every time. The uniform grip comes without the slightest taper and is thick enough to prevent beginners from tightening their grip. The club appears a bit loose at some angles of impact. This is true especially if you are at a tight lie angle. But on all average shots, this one works just fine. 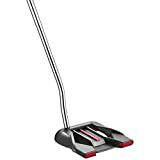 Odyssey X-ACT Tank Chippers Putter with Super Stroke Grip, Steel, Left Hand, 35"
This is one of the most popular mallet insert among the beginners. This one is pretty easy to handle thanks to the large mallet design. The white-hot insert offers a great feel on the greens. The reinforced dual-layer insert is strong on the outside and comes with a soft core. This gives a balanced feel. This would also increase the speed of your shots. There is an oval shaped urethane insert provided in the club. This is an insert that has been specially designed to make the roll smooth so that you can precisely frame your stroke. The roll speed also is enhanced a great deal with this mallet design. Have you noticed that a slippery surface on the club head causes the accuracy of the shot to dampen a bit? This is addressed by improving the friction on the surface. There are numerous options of grips that you could choose from. So whichever type of grip you require, you do not have to hunt for one and go through the tedious regripping process. This one is a two-ball design for better alignment and positioning. Accuracy of the alignment is also improved by the V-line mallet design. The forward swing is perfectly in line with the back-swing. You would notice the club smoothly flow like a pendulum. The double bend design on the shaft provides a full-shaft offset. This is a mallet putter that scores full marks in terms of its design. Its one-of-a-kind design does come with a lot of advantages. This design is engineered keeping every element of performance in mind and has been well-crafted to meet the requirements. This is why this putter is considered a reliable one. A bigger and broader mallet means that you get a forgiveness that blade putters don’t offer. So you can easily work on your shots without having to sacrifice the accuracy in any way. This can be seen in the stable shots that you would be able to attempt with this putter. So the probability of your golf ball ending in the hole would be slightly higher here. The vertical insert design helps improve the grip for the new users. The OS range of putters from Taylormade consists of blade, SM mallet, and mallet putters. The Spider is the mallet putter from this popular range. This one comes as a face-balanced design available both as right and left handed orientations. This comes with a full offset and 3 different shaft length options to suit your stroke length. The double bend neck ends perfectly in a 350g broad balanced mallet. The superior quality finish is responsible for this putter’s killer looks. This is, in fact, one of the best looking clubs on our list of best mallet putters. The lie angle of 70⁰ makes it a great one for most strokes. But some lie angles might be difficult to tackle with this putter if you are close to the greens. TaylorMade N1528348 Grand Slim Large Putter, Left Hand, 38"
Tapered putter grips might be common. But the professionals and the best golfers all over the world are switching to SuperStroke grips, not without a reason. Conventional grips do have their benefits but SuperStroke grips can give you an edge at the putt. Taking this fact into account here is a putter that comes with an option to choose the default grip as a SuperStroke grip. If you would like a standard grip, however, you can choose that as well. Looking for a left handed version, this model has that. Looking for a variation in the shaft lengths, you can find that too. Beginners might find it difficult to work on their alignment. This is one issue that is addressed here by incorporating V-line Fang designed mallet. This itself gives a great feel for the beginners and pros alike. And to enhance the feel the club comes with a perimeter-weighted 345g heavy mallet. By widening the mallet and improving the soft spots, this one helps deliver a smooth roll of the golf ball. No matter which position you are at the putt you would find this putter deliver a consistent and predictable roll. Though the shaft is lightweight, the weight of the mallet balances the swing and thus provides a solid impact. At the same time, you would not feel the slightest vibration on your hands. The fang design helps lock down the ball for a focused shot. The dual alignment lines help fine tune your alignment to improve the accuracy of your swing as well. This is definitely one of the lightest putters out there on the market. Some might thus find this a bit difficult to have control over. The fang design is pretty helpful. But some golfers might find a smoother uniform edge easier to use. When it comes to quality there are hardly few models that are on par with the Odyssey putters. For all the White-hot fans here is another one on our list. This is similar to the 3rd one on our list but comes with a SuperStroke grip. It has been more than a decade since the White-Hot insert design was introduced and its popularity has risen steeply. This is practically magic as it delivers a high-speed roll which is also accurate. This is particularly what you need when you are at the putt. This is also responsible for the solid pro like feel that the putter offers. There are mixed reviews for the SuperStroke grip but there are many who swear by the benefits. If you are one among them, you would love this putter. It comes with a 355g mallet positioned on a light yet durable shaft. It comes with a full shaft offset. With a 3⁰ loft and 70⁰ lie, this one is great for beginners as well as experienced golfers who play often. This offers an accurate and uniform roll every time. So you would know how exactly the output would come. This would help you plan your shots perfectly and get the ball perfectly avoiding misses. The hard mallet delivers the perfect sound during the impact. Accuracy, distance of the roll, and feel, in every aspect this putter scores well over 85%. The putter also scores great in terms of the overall quality of construction. 2-ball putters might take a bit of getting used to. But once you do, you might prefer this one to a normal mallet. We are taking the same putter again but this one is specially designed keeping the female golfers in mind. Coming to the shaft variants you can pick from two options- White Hot Rx Steel or the black Odyssey steel. You also have choices in terms of the shaft length ranging from 32” to 37” depending on your stroke length. When it comes to grips for the putter you could choose from SuperStroke or standard grips. We have considered here the SuperStroke grip here as this is the more popular one and our favorite too. This is one of the best progressive mallets that comes with a dual-ball alignment. You also get to choose full offset shaft or double bend shaft to suit your style. White Hot insert technology is known to be one of the most sought after inserts. But this one comes with an improved version of this insert technology making this putter a favorite among the pros. If you are looking for a putter that would withstand intense practice sessions like a pro, this is one of the best options out there. The steel shaft that comes in the putter is corrosion resistant and long lasting. Whether you choose the white-hot steel or the black steel, it would stay new for years. The SuperStroke grip that comes with the putter is also an all-weather material. So you would not have the hassle of regripping often. The mallet head coating sometimes comes off with long term usage. This doesn’t affect the performance in any way. Because we love Fang mallets and so do a lot of golfers here is another one on our list. This one comes with a SuperStroke grip like the above few models we have covered. White hot insert design has been popular and this is one reason why the brand has a large collection of putters that come with this insert. This gives that classic feel. There are some options for head shapes available and all of these are tour-winning choices preferred by famous golfers. All of them come with the fang design on the broad mallet. Combining the benefits of the popular V-line range of mallets this one boasts of accurate alignment even if you are new to the greens. This would help you in your early learning days. With the fang, you would be able to position the club. With the weight balanced design, you would be able to improve your swing. So with this mallet putter, you can begin your golf journey smoothly and develop a consistent stroke style that can go a long way. This one like the other Odyssey mallet putters comes with the best in class durability. This is one reason why these mallet putters are bought even though they are on the pricier side. They last for years without showing signs of wear. a good idea here would be to use mallet covers to protect the coating on the surface from wearing off. The large grip makes it easy for the beginners to work on their grip. This prevents them from tightening their grip unintentionally by curling the fingers tightly. All the off-center hits aimed with this mallet putter are observed to be quite stable. As with the other fang putter on our list, the fang design is both a plus and a minus. For those who wish to have absolute control over their shots, the fang might seem a bit restrictive. We cannot have enough of the white-hot insert, can we? That’s why we have another one close to the competition. For male golfers who love fang design in the Odyssey mallet putter collection here is another one that works great. This too is a great club for beginners and pros alike. Buy this one during your training days and you would find yourself carrying this in your golf bag forever. After all the club itself does last almost forever thanks to the superior quality materials and construction. You can regrip this putter very easily. One of the most popular choices with grips is the standard tapered grip. But with the growing need for the SuperStroke grip, this model comes with that grip option as well, as we have seen above. It comes with white sight lines which are brightly visible on the greens. This is neither too heavy nor too light and thus comes as a perfect choice to work on the balance of your swing. The impact is solid and the roll occurs instantaneously without the slightest delay. The probability of misses is also pretty low with this putter. It is pretty expensive. So for a first mallet putter, this might not be the best choice. This is a unique design in the White-hot insert collection. For an improved roll, this one comes with a mesh “Metal-X” pattern on the broad mallet. The mesh surface is made of stainless steel. This not just gives solid impact during the hits but also comes with a pretty long life. The T-like design on the mallet comes as a visual aid that helps adjust the alignment. The powder coat on the black shaft gives this putter a slick look and also helps improve its strength in withstanding scratches. This also gives the shaft a matt finish so that you do not face any glare on the field. This one by default comes with a high-quality SuperStroke 3.0 grip which is one of the best on the market. We could hardly find anything wrong with this putter. But this comes with the least chunky mallets of all on our list. And in terms of the price, this is one of the priciest ones as well. But trust me, you would not regret splurging on this putter, even for a moment. 1. Club head design: Broad club head is the most distinguishable feature that sets the mallet putter apart from blade putters. When we say the club head is broad, there could be a wide range of designs actually incorporated. Some come with dual-ball alignment and some which concentrate on improving accuracy. Choose one that would suit your needs. 2. Length of the shaft: This factor is to be considered irrespective of whether you choose a blade putter or a mallet putter. This would depend on the height of the golfer and the way the golfer stoops down. Choose a length such that the golfer’s hands wrap just right over the grip and not above or below the grip. 3. Material of the shaft and the club head: The material would determine two things- the weight and the life of the putter. Steel is a lightweight option. This would help beginners, younger golfers and senior golfers handle the putter easily. But the light weight also makes it difficult to gain absolute control over it. So choose cautiously. 4. Putter grip: A slightly thicker grip would be recommended for beginners. This is because the tightness of grip would influence the shot. It should be neither too tight nor too loose. A thin grip would make the grip tighter and something that is too thick might make it difficult to grasp. This is why you should choose one that comes with the right sized grip. Though you can always choose to regrip according to your needs, the grip that comes by default would go a long way. 5. Consider the pricing: One cannot deny the fact that you should not compromise on quality for the price. But at the same time, without knowing whether the putter is going to suit your stroke style, it would be a waste to buy something very expensive. If you are an absolute beginner, a casual golfer, start out with something affordable. You could always buy expensive ones if you play frequently. Also if you would be taking part in many professional games, you could splurge on a high-end putter without a second thought. This is because a putter is one of the most useful among the other golf clubs. We have listed here 10 of our most favorite mallet putters. All our choices are based on several levels of testing and feedback from the best golfers. We have only listed down those mallet putters that are absolute value for money picks. This means that you would never regret your choice if you buy one. And these are also the ones that are the most popular on the market. So even if you wish to resell them and switch to a blade putter for a change, you can be sure that these fetch you great resale prices. So which one are you buying next? My name is Lydia Lim, and I am a proud mother of one beautiful boy called Jack. I’ve been blessed with a happy and fulfilling life, and I am as happy as I can be. My hubby is a passionate golfer, and he introduced me to the sport in September, 2014. Since that day, I fell in love at the first swing. So You’ve Bought Health Benefits Of Playing Golf … Now What? Copyright text 2018 by golferfx.com. Golferfx.com Skilledgolf.com is a participant in the Amazon Services LLC Associates Program, an affiliate advertising program designed to provide a means for sites to earn advertising fees by advertising and linking to Amazon.com.